This is a truly great and inspiring quote by the recently Sainted, Mother Theresa. 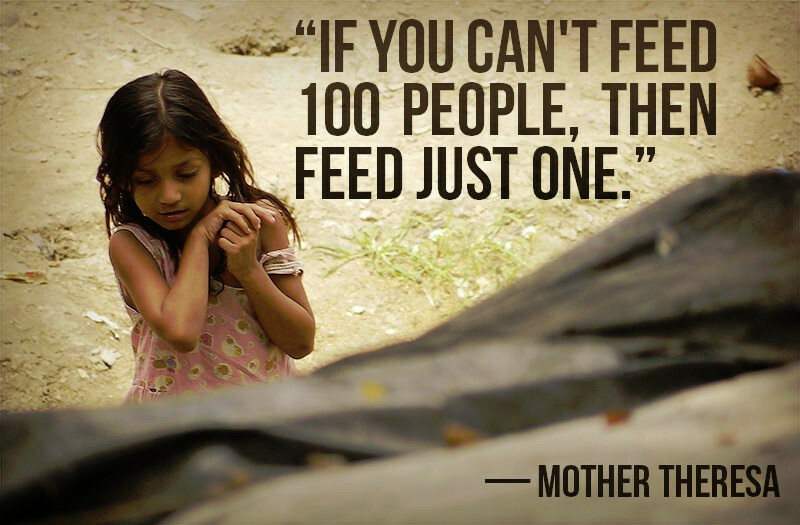 Sometimes we get overwhelmed with the vast scale of the world's problems, especially world hunger, that we often times feel that since we can't fix the problem right away that we should not help at all. This is in fact the same type of thinking that when multiplied across the over 7 billion people on earth explains why we even have any poverty at all in the world. The solution to every world problem or epidemic is simply to change the culture and mindset of ourselves to focus on being more giving and mindful of the world around us. The other important concept to engrave in our minds is that helping anyone, even if it just one person, will bare fruits throughout the lifetime of that person, which in turn will help change the lives of everyone around that person. If everyone just gave a little, especially of their time, in helping those in need, the world would be cured of every and any ailments, which we currently view as distant and unsolvable. So always remember that any charity you give, regardless of how small it may seem, can have a huge impact on the world.